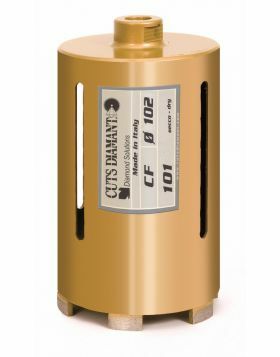 Diamond core bit CF 270 for dry drilling - connection 1 1/4" and useful length of 320mm. The sectors are laser welded with a height of 10mm, length 24mm and thickness 3,5mm. 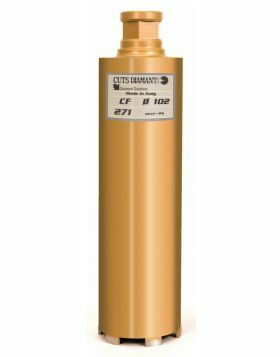 This diamond core drill bit is available in the following sizes: 32 - 37 - 42 - 52 - 57 - 62 - 68 - 72 - 82 - 92 - 102 - 107 - 112 - 127 - 132 - 142 - 152 - 162 - 182 - 202mm. Recommended for drilling the following materials: mixed masonry, hollow blocks, bricks, concrete. To be mounted on core drill machines.